Free up the airflow from the engine and give your Powerstroke more power and better economy. 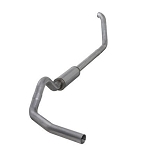 Optional muffler aluminized steel construction. 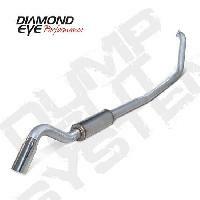 Diamond Eye Performance exhaust systems are built just the way you want! 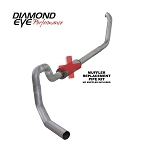 Upgrading your exhaust has definite benefits--particularly with Diamond Eye systems, which offer lower EGTs, more horsepower, better sound quality, and more passes by the pump. CNC mandrel-bending machines and support equipment allow their technicians to fabricate non-restrictive, free-flowing systems to benefit your engine. 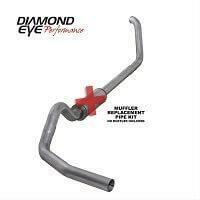 Diamond Eye affords you the choice of standard or muffler replacement kits (RP) in a variety of 3 in. models, up to bigger and better 5.0 in. systems, in either economical 16-gauge aluminized steel or longer-lasting, good looking 409 stainless steel. These kits are also designed to reduce your installation time; hangers, clamps, and hardware are included to complete your job. 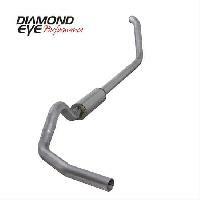 For a great fit and finish, bolt on a Diamond Eye Performance exhaust system.